game based learning | amidoinitrite? 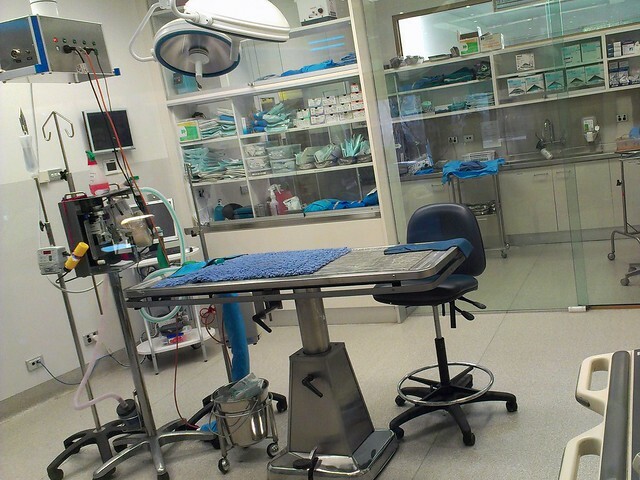 Dr Sigmeund Softain is specialist surgeon. He was responsible for pioneering The Softain Biopsy medical procedure. 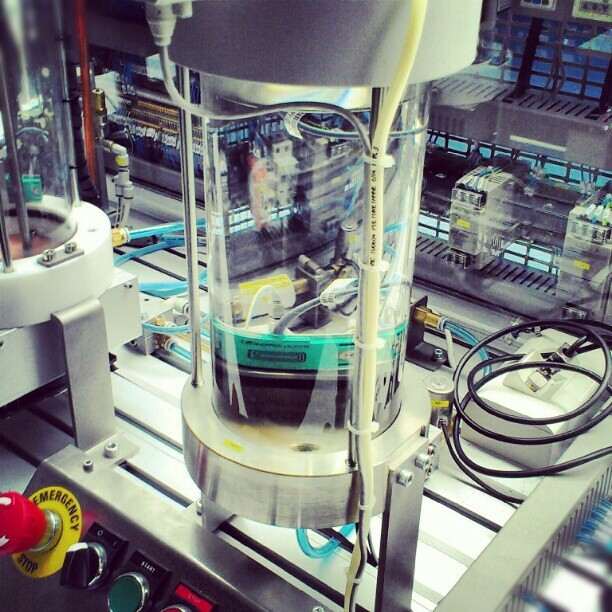 Dr Softain’s research is experimental and ongoing. He Tweets his day-to-day research activities and also discusses his work and recent findings on his blog. One day everything changed. Something went wrong in Dr Softain’s laboratory. An experimental medical procedure went awry. An outbreak. Amidst all the chaos and confusion Dr Softain recorded his final broadcast. An emergency broadcast warning us of an unknown peril. All that was remained was a pool of blood and Dr Softain’s laboratory pass. I recorded and edited Dr Softain’s emergency video on my iPad. I then used Aurasma to create the video augment. 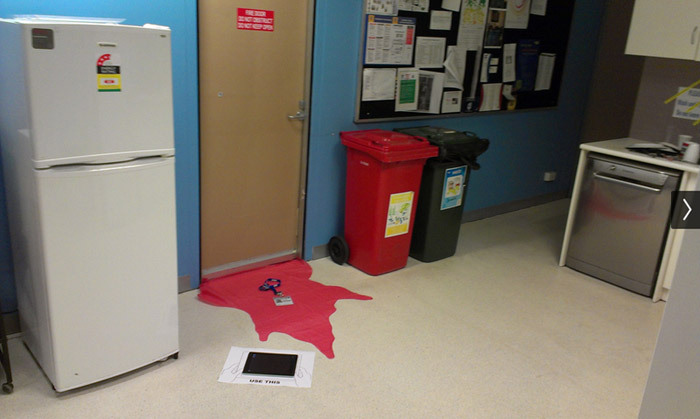 Early one morning I set up the installation made up of the pool of blood, Softain’s lab pass, iPad with Aurasma and instructions outside a fire door in the kitchen of my workplace and then waited for work colleagues to discover the installation as they visited the kitchen for their morning coffee. Thinking about it, this wasn’t really an augment. 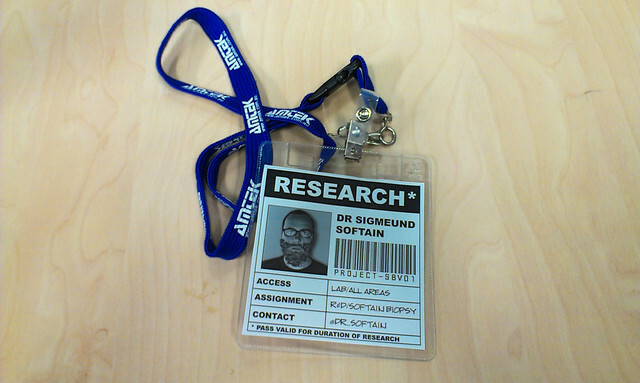 It didn’t augment reality with a fictional layer. 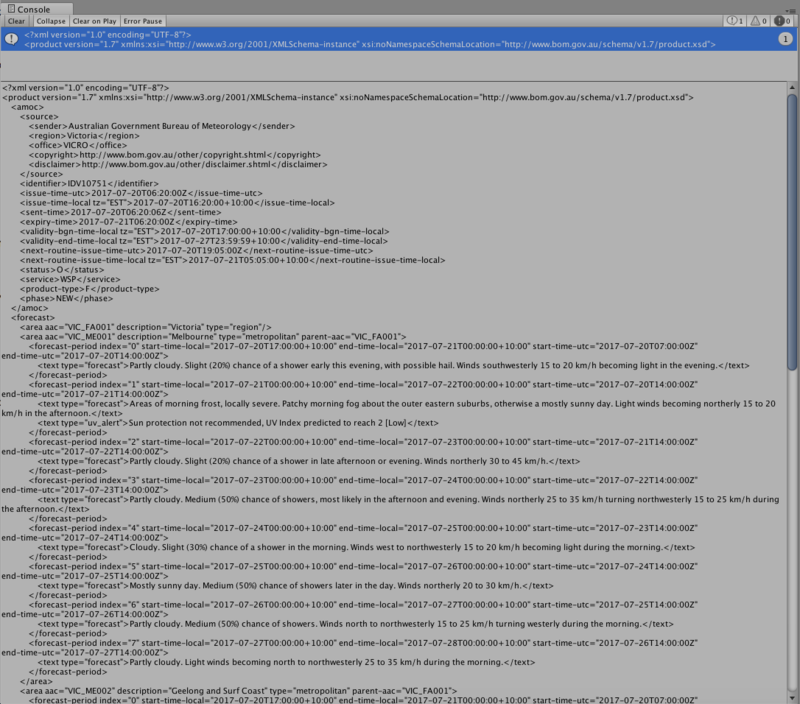 The layer was simply triggered, much like a QR code. Also the metaphorical container for displaying the augment was wrong. Lame. 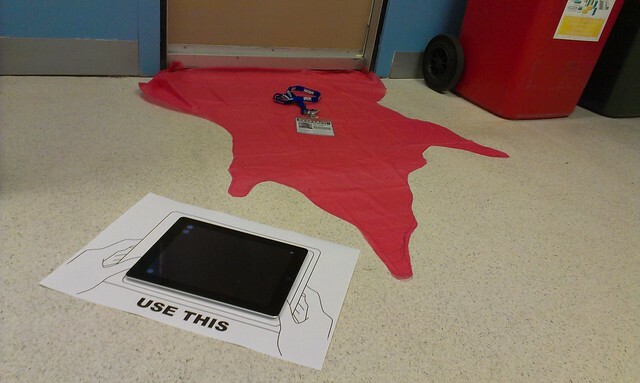 A better augment would have been to animate the pool of blood or design an intercom to display the video. The situation was also goofy. 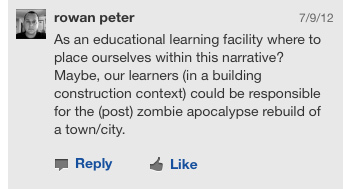 This kind of scenario (minus the zombies) could be used as an element of a larger campus-wide activities such as student induction or OHS/ workplace hazard identification audit. I used my iPad to shoot the video and then edited the video and overdubbed my own sound effects with Pinnacle Studio 2.0. Days later or maybe even weeks later is a concept for a collaborative workplace/institute/teaching centre-wide activity for staff and students designed to mend the physical and psychological effects of the Victorian government’s $300 million in cuts from the state’s TAFE sector. Physical and psychological effects could include closure of campuses, a reduction of courses being offered and job cuts. 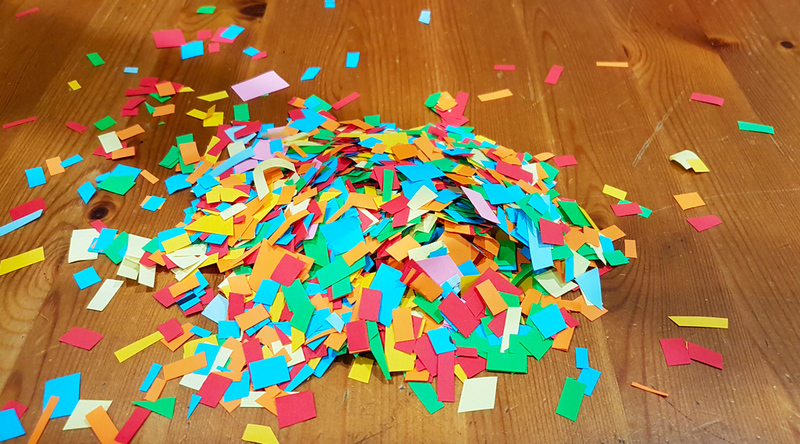 This blog post contains exerpts from a conversation about the concept I had with myself on our organisation’s Yammer network. 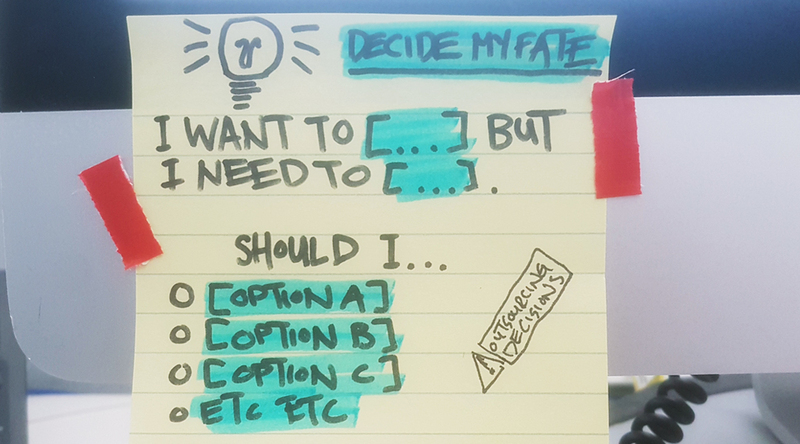 This blog post attempts to consolidate the concept. 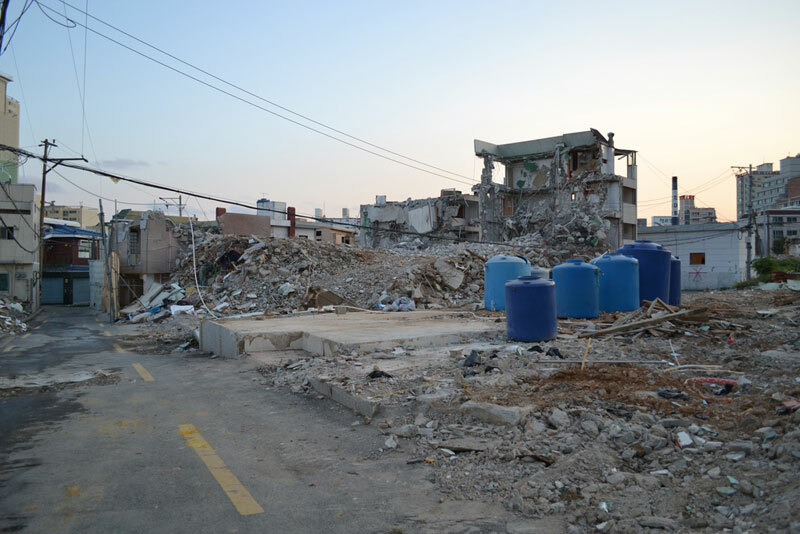 I saw the activity taking place after the catastrophic event. It could’ve been 28 days later or even 28 weeks later. It doesn’t really matter. Just as long as the scenario provides an exposition, defines the goal(s) to be achieved by staff and students and also describes the resources/materials that are available for use. I saw the activity involving the every staff member and their respective teaching centre. From the top to the bottom of the organisational chart. 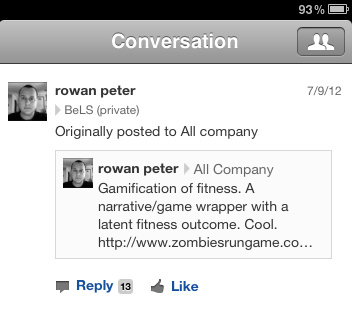 The CEO would actually play a pivotal role in activity. They would be responsible for broadcasting/providing updates on the progress of the activity. These updates would also allow activity facilitators to adjust the activity if/when required. I saw each teaching centre being responsible for helping students contribute a specific artefact or service from their particular area of expertise. The artefact or service (and production of) would contribute to the activity while also satisfying the students scholastic assessment requirements. Nothing about the activity changes the need for students to demonstrate their skills and provide evidence of their competence. It’s just their output or artefact may change, but not how they work through the process of creating the artefact. I didn’t want the activity to involve only our Australian based campus. I wanted the activity to be inclusive. What better way to reach out to our state and international counterparts than a part in a inter-campus activity. Hospitality Tourism planning is highly complex and requires integrated and flexible approaches. The activity would reflect the typical nature of each particular area of study. for example, hospitality and tourism is a complex industry that requires flexible approaches and unique problem solving skills, particularly in the context of responding to a natural disaster. Real-world examples that require application of employability skills and dimensions of competency. Scientist area always important in an activity involving zombies. They serve as one of the last hopes – finding a cure! The activity would take place in real time and play-out over an entire semester, perhaps even the entire scholastic year. Although maintaining momentum over this period of time could be difficult. The pacing of the narrative would be informed by the deliverables of each course. 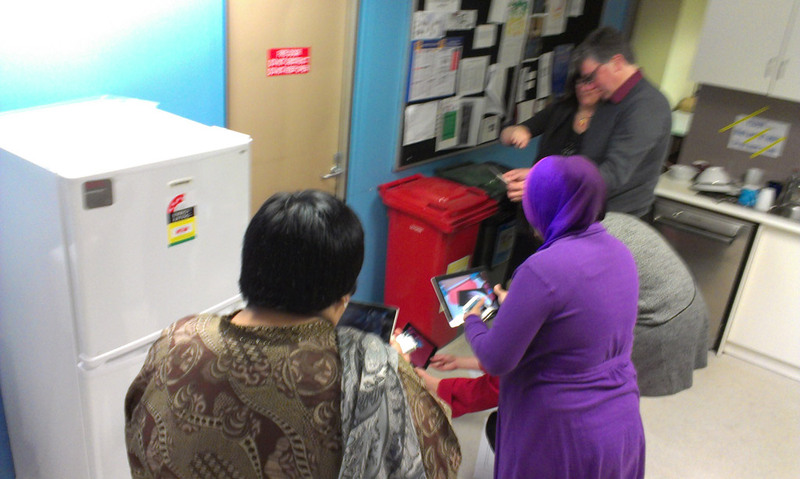 Testing the activity on a teaching centre could be a good way to identify issues. Then I realised. Yes. This is a zombie game. This activity would take place openly and in public. 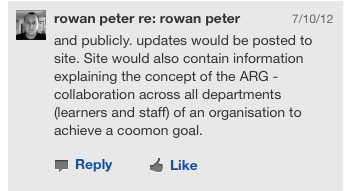 Non-students and staff would be able to observe the progress of the activity via the organisation’s website. Completing the activity publicly gives people the opportunity to see the work the students and staff are doing together (Outside an open day, showcase or expo context). 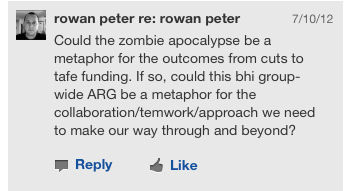 Then I realised the zombie metaphor is problematic. 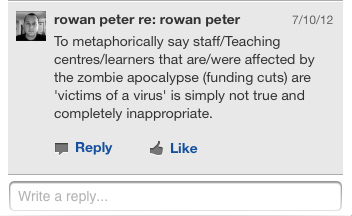 Staff and students are not to blame for the funding cuts. Although the activity may not be completely appropriate at this point in time, I do think there is potential for a collaborative workplace/institute/teaching centre-wide activity for staff and students to occur. 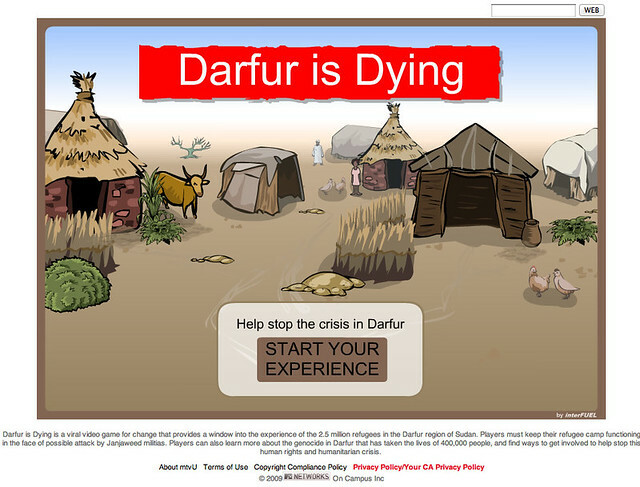 This post documents my thoughts on Darfur is Dying as part of the Week 1 activities research into Serious Games for the Games Based Learning (GBL) MOOC. A game that deals with conflict and civil unrest clearly has no winner. Darfur is dying provides an insight into the life of people living in the Darfur region of Western Sudan during the civil war in Darfur. Throughout the game the player is prompted with education points and information on how they can help stop the crisis in Darfur. This game is successful in creating an awareness and reaction to a situation which would not normally receive much attention from mainstream media. Viking Quest is an adventure game produced by BBC History. 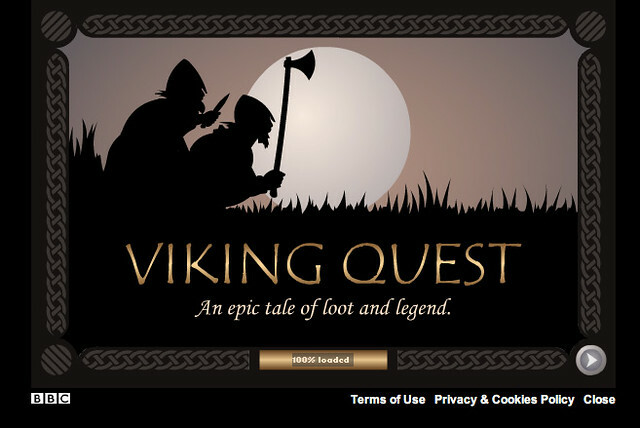 This post documents my thoughts on Viking Quest as part of the Week 1 activities and research into Serious Games for the Games Based Learning (GBL) MOOC. Viking Quest is an adventure game produced by BBC history. The player is placed in the role of a viking who has been issued a challenge by their chief. The challenge is to travel to a distant land, loot a monastery and then return to Norway with the treasure. determine if they should burn the monastery. Viking Quest provides an overview of the type of activities (Sailing, looting, ship building), technology/transport (Longships, weapons), commerce (Loans/Borrowing money, slavery), belief systems (Casting runes – Consulting the Gods, Christianity), settlements (Froya, Strandebarm, Kaupang) established by Viking culture. Without knowing the scope/audience for Viking Quest, (but knowing that it was produced by BBC History) I think it’s reasonable to assume that the broad overview of Viking Culture presented in the game was the intended learning outcome. I also think it’s reasonable to assume that Viking Quest may be part of a larger and perhaps more detailed learning/educational resource on Viking culture and could be regarded as complementary material.